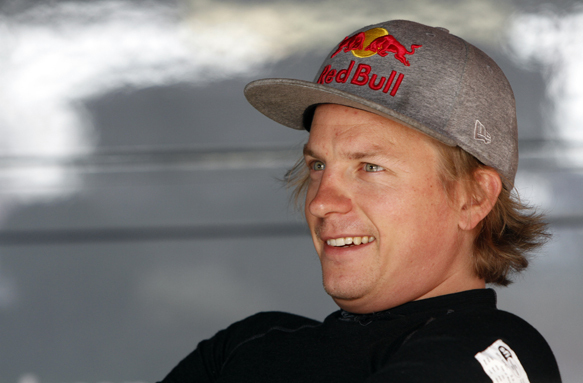 Enigmatic Finn Kimi Raikkonen has recently visited the Williams team headquarters, sparking rumours that the 2007 world champion may be about to make a return to F1 with the legendary British squad. Having quit the sport at the end of 2009 to try his hand at rallying, Raikkonen, who won 18 grands prix with McLaren and Ferrari, has admitted he wants to race again. Will Sir Frank's eponymous team do what it's often done so well in the past – snare a top name? After all, it worked well with Nigel Mansell (1985), Nelson Piquet (1986), Alain Prost (1993) and Jacques Villeneuve (1996). 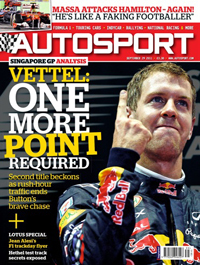 AUTOSPORT's news team assesses the benefits of a Raikkonen/Williams partnership in 2012 and outlines the potential pitfalls for both parties as we wait to see if there will be six world champions on the grid in F1 2012. Mark Hughes column – Our Grand Prix editor explains why former F1 driver Jean Alesi has decided to (try to) race in next year's Indianapolis 500 IndyCar showcase with Lotus – at the age of 47. Singapore GP – Full report from the 14th GP of the season – on the floodlit streets of Singapore where Sebastian Vettel crushed his rivals for the ninth time this year, and Lewis Hamilton was in hot water again. Lotus T125 – the F1 car you can drive – Under the skin of the Lotus T125, a F1 car developed by Jean Alesi to represent the ultimate track day experience. Flat-out around Hethel – Sportscar race and Lotus ambassador Johnny Mowlem takes us round the rebuilt Hethel test track in Norfolk. Le Mans Series Estoril – Gary Watkins was in Portugal to see the Pescarolo squad win its third LMP1 drivers' title, thanks to the race-winning efforts of Frenchmen Emmanuel Collard and Julien Jousse. British F3 Donington – The penultimate meeting of the season resulted in wins for Carlin pair Rupert Svendsen-Cook and Kevin Magnussen and a maiden British series victory for new GP3 champion Valtteri Bottas on his debut appearance. Ben Anderson watched it all unfold. Snetterton at 60 – The Norfolk venue celebrates its 60th anniversary this year, so Kevin Turner takes a nostalgic look back through its history, charting the early years right through to the recent renovation under Jonathan Palmer's MSV leadership. Penske Power boost – A few years ago Australian Will Power was a part-time Penske racer, driving a third car in IndyCar as and when funds allowed. Now, however, he's the celebrated squad's de facto number one and leads the standings with two races left. Mark Glendenning explains the transformation. From the archive – Carlin is a dominant force in single-seater racing, but did you know it ran a Porsche Supercup car for one season in 2001? We look back on its only win – at Indianapolis at the end of the year courtesy of Sascha Maassen. Race of my life – Al Unser Jr tells Mark Glendenning what a relief it was to uphold family honour by adding his name to that of father Al Sr and Uncle Bobby on the list of Indy 500 winners in 1992.